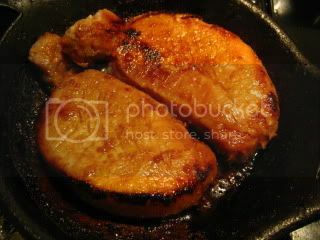 I marinated thick cuts of pork chops in shio-koji paste for 2 days. The paste was lightly wiped off and the meat was seared in my black toban (donabe skillet). What's great about toban is that you can make a quick steak or saute dish in it and bring it right to the table for service. It also cooks faster than a regular pan, as toban builds intense heat in it and it also gives the effect of FIR (Far Infrared Radiation). 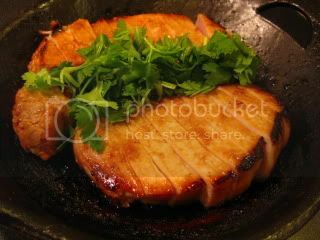 4-5 minutes on one side, flip and splash a little sake to the skillet, and cook for a few more minutes over medium-heat. The dish was ready. 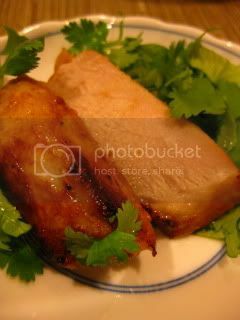 I just served it with chopped cilantro and lemon wedges. What a tasty dish!